Forever Unique Miley Off Shoulder Skater Dress. Stand out from the crowd in the Miley blue printed off-shoulder skater dress. 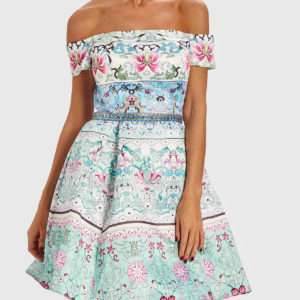 This fit and flare dress with Bardot neckline is adorned in a beautiful ornate print, perfect for the races, wedding or celebrating your birthday. Red blouse and skirt by Leilou with tunic style blouse and tulip shape skirt. Pronovias It’s My Party blush mermaid tulle and lace formal dress. Features lace bodice and skirt applique detailing and tulle mermaid fit and flare bottom.